Can’t remember when I ran a 1.500m-race last time. Anyway, I got my first State title in Saxony-Anhalt and at the same time the first title in the senior category. Of course the 1500 were way to short. Furthermore I wasn’t even running in spikes and made some tactical errors (ran the first 1300m at the front and then got passed by two other runners). Let’s see what I can run in the 3000 this weekend. The same procedure as last year? Same procedure as every year! 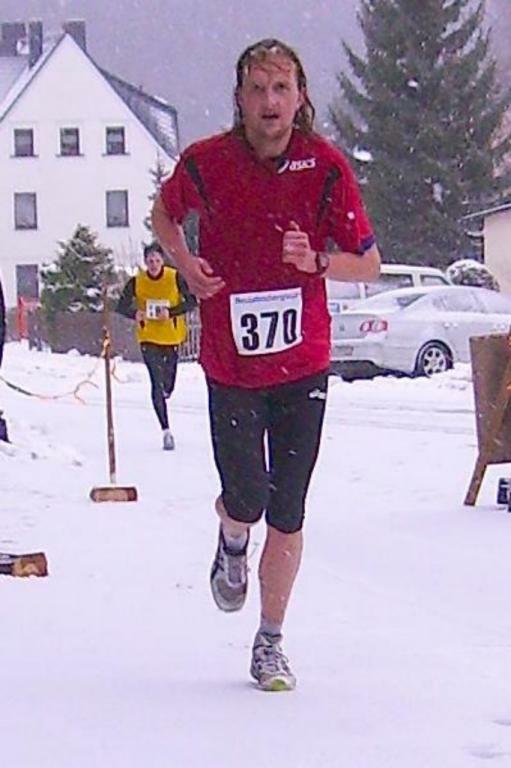 For the 16th time I was competing in Falkenstein and this time it was again “funny” to run in the snow storm. 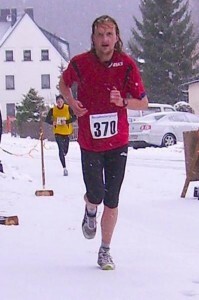 Maybe on the downhills it was not so comfortable because of the somewhat slippery conditions. The last race of the year. Just like the whole year it was mostly difficult to keep up the pace and enjoy the feeling of rolling along. Nevertheless, I am back to running 33minutes without an all-out effort. The best race since a long time. Seems this old man is on his way to a better shape. Also great to run in front of the home crowd. After the race in Roßbach the day before, I decided to run another race on Sunday morning. Again it was a cross-country like course in the forest, but this time I was prepared because I knew the course and the underground from the last Heidelauf. I found the right pace better than yesterday and was really lucky that I had no orthopedic problems with ankle and hip joints. Another good training weekend done. Nothing more. Of course weekends are there for racing and if there are competitions in the area I use them instead of training. This time the course was a 12K on uneven ground, i.e. cross-country like. Maybe that was the reason why I had pretty big problems getting into race rhythm. It took some kilometers until I was rolling and only the last 5K were feeling good. For the record: No new record in Glauchau But anyway a bit faster than the weeks before and again with a bit more joy during the race. Once the leg turnover is better, faster times are about to come. This time I decided to go to Dresden to run a competition, of course it was another training race and that’s why I spent the whole weekend in Dresden. Meeting up with some old running mates (Marc Schulze § Co.) and going to a concert the day before were just as important as the race, so it was an opportunity to have a good time and be relaxed. Considering the fact that I still was at a great + really intense concert some 10 hours before the start, I just expected this time of just under 35 minutes. After all it’s faster than my last races and I was pain-free. At some point it even felt like running but that was only for a couple of hundred meters…but at least a start to begin with. My next race is going to be in Glauchau, which is close to my homew town and I’m going to vistit my family and some old friends. With a “normal” preparation I should be a bit faster than in Dresden again. Also the training is going well, even though I’m only in the second week of normal training (i.e. training with some speed work). Instead of training alone, I decided to go for another local race. It was a nice race and the weather was just great for autumn. 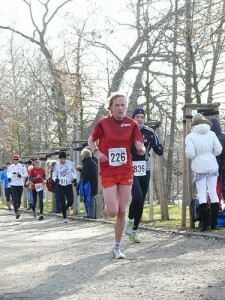 The pace was not very fast (as usual) but there is a tendency now towards a better shape. Most important was, that my hip did not cause any problems and apart from some stiffness in my gluteus I felt very much in control. Another “test run” after the 10k race last weekend. Also in this race I was almost completely pain-free. 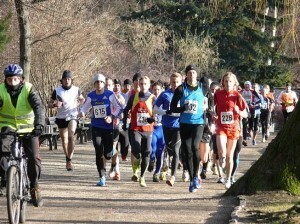 However, since there were some more talented runners this time I had to find my own pace behind the leaders. The race takes place on a cross-country-like course and the forest underground is very tricky with roots, stones and other unevenness. Crossing the finish line some 3 minutes behind the eventual winner and training mate Fabian I was shown, what is required to get back to a normal running shape: consistent training with regular speed workouts. Since I don’t have any problems now, those workouts will be added to the training plan in the next days and I hope that I was already of the low-point of this year.